Lesser cold, the 23rd solar term in the lunar Shiber and the fifth solar term in winter, marks the beginning of the winter season. When the sun reaches Huang Jing 285° (lesser cold), for the Land of China, it marks the coldest day of the year.When the sun reaches 285 degrees yellow, the lesser cold solar term begins. 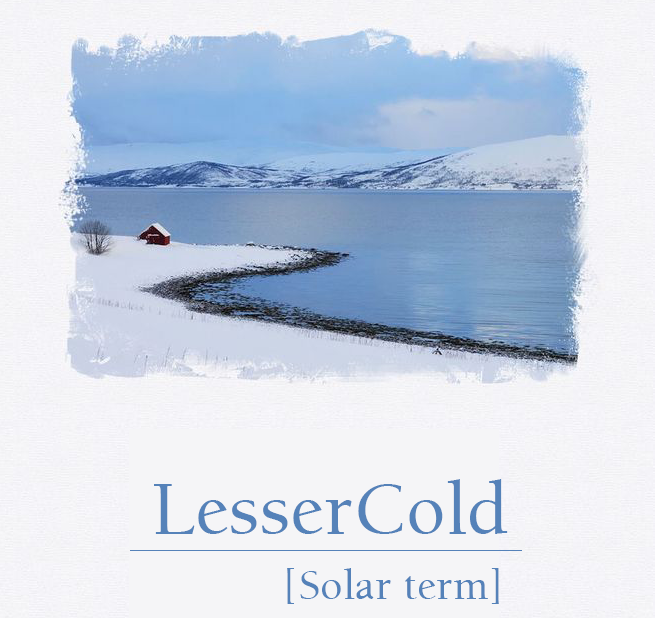 Cold is cold, lesser cold indicates the degree of cold. South China, the winter warm in January, frost and snow invaded, often frozen, the lowest temperature of 10 ℃. The lowest temperature in north China is less than 5 ℃, and less than 0 ℃ in southern South China. The coldest region in China is the northern part of Heilongjiang, with a temperature of around 40 ℃, freezing and freezing. The lower-elevation valley is the warmest place in most parts of southern China, where the average temperature of January is around 12 ℃, and only a few years may be below 0 ℃. In addition, the inverse temperature effect is very significant, so the banana, mango and other tropical fruits can grow well. Lesser cold Solar terms, the largest development of East Asia trough the most powerful and stable, Mongolian cold and Aleutian low pressure also reached the most powerful and stable, westerly trough Ridge scale to achieve maximum, and with the strongest westerly intensity. lesser cold Throttle cold air cooling process is frequent, but to reach the standard of cold wave is not much. As the saying goes, "cold in 39". "39" more in January 9 to 17th, also just in the lesser cold solar terms. But this is a general rule, and a few years cold may also be colder than the small. And people remember the winter of 1975, the lowest temperature of the solar terms is snow! South China in winter the lowest temperature is not low, conducive to production, but also suitable for the development of a variety of operations. "Ordered not to move, born Southland Xi" citrus, growth generally requires that the temperature is not less than -5℃, the annual temperature is higher than 15 ℃, most areas of South China can be met, the deputy tropical plants are almost everything. Therefore, the unique climatic conditions should be a very important factor. Lesser cold Solar terms, people should also pay attention to the meteorological observatory of strong cold air forecast, prevent wind cooling and rain and snow weather on the impact of Spring Festival, pay attention to frost-proof.